Whether car and truck drivers want to acknowledge it or not, bicycles and motorcycles have the same rights to use California roads as any other vehicle. With a few exceptions, bikers and motorcyclists share similar responsibilities regarding safe conduct while operating their respective vehicles. When an accident occurs, it may be easy for police and the public at large to assign blame to a rider. For that reason and many others, it is important for victims of bicycle accidents and motorcycle crashes to have an experienced attorney on their side. At the law firm of Corsiglia McMahon & Allard, L.L.P., in San Jose, our skilled lawyers are highly experienced in a wide range of personal injury matters, including bicycle and motorcycle accidents. We have helped countless riders obtain successful verdicts and settlements after suffering injuries caused by the negligence of others. If you have been injured in a motorcycle or bicycle accident, contact us today to discuss your options; call (408) 289-1417. We offer a free initial consultation. For the most part, a bicycle is simply another vehicle on the road. It is due all the respect and deference as any other vehicle. Bicycle riders are required to obey traffic signs, signal turns and operate their vehicles in a safe manner. Despite the equal status accorded under the law, many motorists treat bikers as an inconvenience. 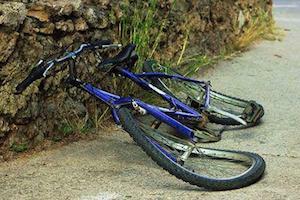 Car and truck drivers often claim that they never saw the bike until they hit it. The truth is that inattentive driving is a large problem and it has life-threatening consequences for bicycle operators. In California, bikers are required to wear helmets that have been approved by the Department of Transportation. In addition, motorcyclists are required to obtain a license to operate their motorcycles. These represent the largest differences between bikers and other operators of vehicles in terms of legal duties. The absence of a helmet or a license does not mean that a rider cannot obtain compensation after an accident. If a car or truck driver behaved negligently and that negligence caused you injury, you need to speak to an attorney to understand your options. To learn more about your rights and responsibilities after an accident, contact our experienced lawyers today at (408) 289-1417.